is elated to Celebrate the Life of this woman leader, a women’s activist that would tell you ‘just do it‘ Her work in trade unions and work in the women’s movement were interrelated ways to change Canadian society. Because of her hard work and she was able to bring organization and their workers closer together in a peace movement. She retired in 1983 and became the President of Voice of Women in 1988 until she passed away. “She was small, but mighty” said Marilyne White, wife of Canadian Labour Congress (CLC) former president Bob White. In her time (1918–1993), Grace Hartman fought not only for women’s access to the workplace and for equal treatment in the workplace, but also for the kind of workplace that recognizes that most women are caregivers and housekeepers in addition to their paid work. Grace was a pioneer in seeking pay equity – paying women the same as men when they do work of equal value. Just in case you think that problem has gone away, Statistics Canada recently released a study that found that women’s work is still only worth about two-thirds of men’s work – women have an after-tax income of only 63% of men’s work. OK, it used to be 52% and the work of women like Grace has brought some gains since the mid-1980s. But there’s more – women are doing more unpaid work than men. I keep hearing that young women today are not as active in the cause of women as in the last 30 years because they are so much better off. We may be better off if we compare ourselves to women of the past, but we are not better off compared to men. It all began in 1918 in the town of Markdale, Ontario, where she was born Grace Armstrong, daughter of Mark Armstrong, a manufacturer and magistrate after whom the town was named. Early on, Grace developed the traits of leadership which bloomed throughout her long life. She topped her class scholastically and excelled in athletics, particularly in skating, running and gym. As a very young girl, she organized a group in Markdale to collect salvage during the World War One – salvage of products made of metal was probably one of the earliest attempts at recycling. She was also the youngest ever president of the Young People’s Association at Markdale Methodist Church. After high school, she enrolled at Victoria College, University of Toronto, where she was president of the Women’s Literary Society and vice-president of her year. Ontario College of Education followed university, after which Grace taught English, French, Latin, Phys Ed and Art at the high school level. Always interested in other cultures, Grace took a two-year break to travel around the world to see things firsthand. She taught English for a year at a French normal school and French at an English private school. Travelling on to Japan, Grace took lessons in Japanese dancing and made a study of classical drama, all the while teaching others Canadian folk dancing and customs. 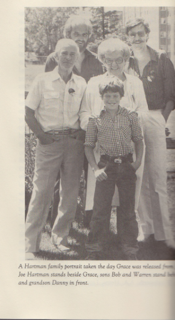 Grace was only five when her mother died of lung cancer, the same disease that led to Grace’s death in 1993 at age 75. 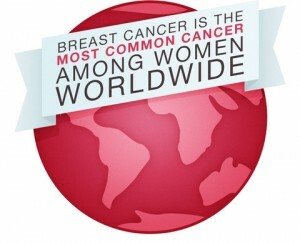 Grace overcome breast cancer in 1948 when her first-born, Warren, was six years old. Ray Hartman was left to care for his young family in their home on Palmerston Avenue, helped by his mother, Margaret Fulcher. Within two years, he married a much younger woman, Jean Gibbons. Grandma Fulcher stayed on to help with the younger children, and another woman was hired to carry out household tasks that were too heavy for her. Despite the problems that so often beset relationships when a step parent comes on the scene, the children adjusted, helped by the fact that they were spirited and independent by nature. They were also a musical family. All of them read music and played the piano or sang, eventually forming the Fulcher Choir which performed in churches near Elmira in southwestern Ontario. As a parent, Ray is remembered as fun-loving, egalitarian, fair, and a father who always encouraged his children to do what they thought was right. Grace met Joe, a stonemason, at a party in 1934 when she was only 16 and he was 23. He lived in the neighborhood and by the following year their relationship was blossoming. Joe, half German, had emigrated from Scotland with his family, one that was known for its dedication to union politics and progressive causes. Although the couple didn’t marry until 1939 – each of them was committed to seeing their siblings through school first – they were both considered one of the family in their respective homes. During this period, Joe’s mother, Mary Hartman, was a feminist influence on Grace. Grace and Joe were married for more than 50 years. Like Grace, Joe was a feminist, well ahead of his time as a husband and partner, one who was always 100% behind Grace’s endeavors, never insisting that she stay home to cook supper or look after their two sons, Warren and Bob (back row, right and left). However, the family did gather together for Sunday breakfast, something that was known to go on until mid-afternoon according to son Warren. Grace, though, recognized just how much her husband facilitated her public fight for women’s rights, especially in the trade union movement. Grace’s 16th year marked another turning point in her life. Her father lost his management job in a paper company, and had to accept welfare before he finally regained financial independence. Grace dropped out of Grade 11 at Harbord Collegiate and went to work to augment the family income. Her grandmother had taught her needlework, a skill that brought her employment with the Oriental Carpet Company on Wellington Street in Toronto, repairing and putting borders on carpets for a beginning wage of $10 a week. It was the Depression and, through Joe, Grace joined the Workers Educational Association and attended its lectures. It led to her questioning the conservative political values of her home. Joe had joined the Communist Party in 1932 and Grace became active in the Young Communist League. His daughter’s political involvement upset Ray Fulcher, especially as he feared for her safety during the violence that marked Communist activities from time to time. In 1936, at age 48, Ray Fulcher died suddenly of a coronary. While still plying her needle, Grace took secretarial courses that for her were the door to a broader and more ambitious future, one that wouldn’t really begin for several years. In 1941, Grace went to work for the United Electrical, Radio and Machine Workers (UE), known for its left-leaning sympathies. While her boss was absent much of the time as a result of his political activities, Grace ran the office and helped with organizing drives at General Electric and Westinghouse, another lesson in trade union organization. However, Grace did not get his job when he left. At the end of 1941, Grace left the working world for a seven-year period, doing temporary work. She joined a splinter group, known as the Ontario Executive, in a storefront at Queen and Shaw Streets where she lit the coal stove in the mornings, answered letters and the phone, and distributed leaflets at plant gates. 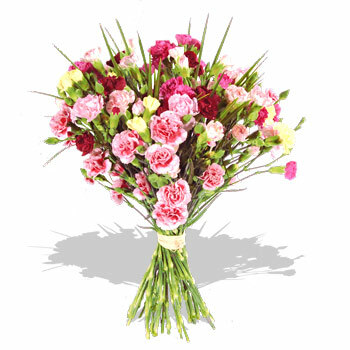 It was a job in which Grace learned a great deal about workers’ points of view, information that was to stand her in good stead as she moved gradually towards leadership in the trade union movement. She became a member of Local 373 of the National Union of Public Employees (NUPE). Local 373 represented the “inside” (office) workers who were 63% Women. Local 94 of NUPE represented the “outside” workers who were almost exclusively men. There was animosity between the two locals. The outside workers would always bargain with the employer first, and whatever was left over in terms of pay and benefits went to the inside workers. In the late 1950s, Grace put up with the demeaning comments women suffered in a milieu dominated by men. Bill Overcott of Local 43 said at a Toronto District Council meeting. By the beginning of the 1960s, Grace had won a good few battles and was on her way up in the trade union movement, already president of Metro Toronto District Council of Public Employees and about to start work as secretary of the Ontario division of the National Union of Public Employees. CUPE claimed its first pay equity breakthrough on July 1, 1967 (Canada’a centennial year) when female members of Local 101 in London, Ontario, won an end to wage discrimination. The local’s previous collective agreement contained two wage schedules, one for women, another for men. The women identified these differing schedules as a “sore point” and were able to win equal wage rights. In 1966 she was in the news, along with her colleagues at CUPE, as she led a rally at the Ontario Legislature to present the government with a Bill of Wrongs. Nearly 2,000 people turned out and it was a great success. The document listed ten pieces of legislation which explicitly discriminated against public employees, affecting some 35,000 workers in Ontario. She handed the bill to Allan Grossman, then Minister of Correctional Institutions, who wasn’t happy at having to respond. Hartman had become a member of Laura Sabia’s Committee for the Equality of Women in Canada (CEWC), joining its steering committee in her capacity as chair of the Ontario Federation of Labour’s (OFL) Women’s Committee. 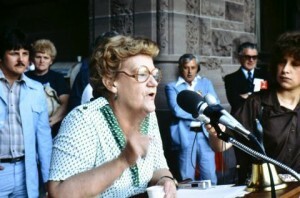 By the time the delegation went to Ottawa later that year to see Prime Minister Lester B. Pearson, she officially represented the Canadian Labour Congress (CLC) as well as CUPE. The prime minister backed out 20 minutes before the delegation was due to make its presentation and sent a replacement, Lucien Cardin, who attempted to soft-soap the delegation. Hartman responded by sending a letter to the prime minister severely chastising him for Cardin’s patronizing remarks to the group. Grace Hartman was acclaimed President of CUPE at a national convention after the previous head announced his resignation in January, 1975. Referring to stringent federal anti-inflation measures put in place by the Trudeau government of the day, she vowed to lead the union into the fight of its life. “We will turn the heat on and melt the wage freeze,” she pledged. In 1981, at age 62, Hartman was jailed for 30 days for defying a Supreme Court order to end an illegal strike by Ontario hospital workers. She said it was a price she was glad to pay to combat what she saw as low pay and a denial of bargaining rights for the hospital workers – mostly women. Son Warren recalled that his mother’s first night in the detention centre was one of the most frightening experiences of her life. “When the doors slammed close behind her, there was nothing she could do. I think she felt very lost and very frightened that night.” But after she was moved to a minimum-security jail, she made the best of a bad situation. Altogether, 36 hospital workers were fired, 3,442 were suspended, and 5,582 received disciplinary letters as a result of participation in the strike. In the months following, CUPE successfully fought the employers’ actions through arbitration. 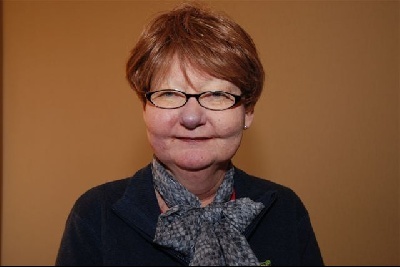 In 1983, at age 65, with CUPE’s membership at 294,633, and with eight hectic years as president of Canada’s largest union behind her, Grace Hartman decided to do what most workers do when they reach retirement age – retire. 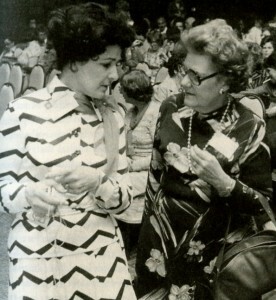 In 1984, Grace received the Toronto YWCA Women of Distinction Award. 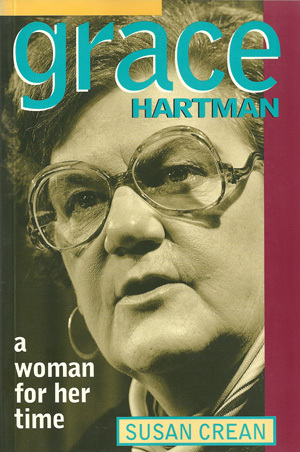 In 1988, Grace was voted president of Voice of Women. Voice of Women, since 1960 a voluntary nonpartisan organization with members in every province of Canada, has opposed violence and war and promoted DISARMAMENT and peace. To this end VOW has organized extensive educational campaigns, lobbied all levels of government, held meetings and conferences including 2 international women’s peace conferences, and sent representatives to other countries to consider the mutual concerns of women and to promote action. Regular meetings take place in many centres, and VOW initiates and supports campaigns with other groups. VOW is a member group of the NATIONAL ACTION COMMITTEE ON THE STATUS OF WOMEN and PROJECT PLOUGHSHARES, and has a representative on the federal government’s Consultative Group on Disarmament and Arms Control. In 1992, she was inducted into the Canadian Labour Hall of Fame and received an honorary doctor of laws degree from York University. Hartman, who traveled 300,000 km a year attending union functions, was once dubbed “the loving granny.” She was often seen with her needlework during meetings and, although she could be aggressive in pursuit of goals, her manner tended to be quiet during discussions. On women’s rights, a hard edge would emerge. Addressing a conference on women’s rights in 1972, Grace Hartman asserted, “Unions can be just as discriminatory as employers, just as discriminatory as tax laws, just as biased in favour of men as the rest of society.” This statement makes me think that Grace was a realist – she looked at what institutions and organizations actually did, how they actually behaved. When it comes to the treatment of women, we assume that those who talk “rights” deliver rights. History tells us differently. If you want to measure what a government, an employer or an educational institution is doing to advance equality, don’t just look at what they say. Look hard at what they do. Same goes for movements – union, peace, anti-globalization. How are women being treated? 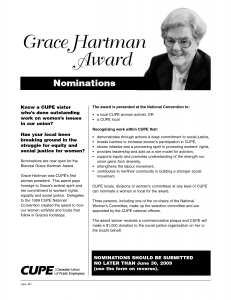 This book began as a project of the National Women’s Task Force in the months following Grace Hartman’s retirement as president of CUPE (Canadian Union of Public Employees) in 1983. Interviews were done with Grace in subsequent years, most especially a wide-ranging series by Wayne Roberts in 1989. I was approached to write the book that year, and in 1993, shortly before Grace died, CUPE’s national executive Board agreed to fund it and allow me access to the CUPE archives. I’d heard horror stories of writers commissioned to write union histories, and the difficulties with having to satisfy all concerned sometimes even ended with a manuscript never published. My experience was nothing like that; there was fulsome help and advice from Judy Darcy (then CUPE president) and the people in her office. A good part of the pleasure of writing the book was exploring labour history with people who had been part of the struggle and had stories to tell. It was also getting to know Grace’s son Warren who was in theatre and teaching at Brock University at the time, and her husband Joe. Both remarkable people who talked to me at length about her life. There were two other key advisors: Gil Levine who had been director of research for many years was an admirable back up on history and politics, and Louise Leclair then in the BC Regional Office. Commissioned books like this only happen when someone is committed and bloody-minded enough to see it through. In this case that person was Louise. Out of print. Available used, e.g., through AbeBooks. Or check the holdings at local libraries. welcomes this woman into our global alumni, as a memorial to some of the great women pioneers, as one of our women leaders that worked to ‘better the lives of all women’. Rest in peace.